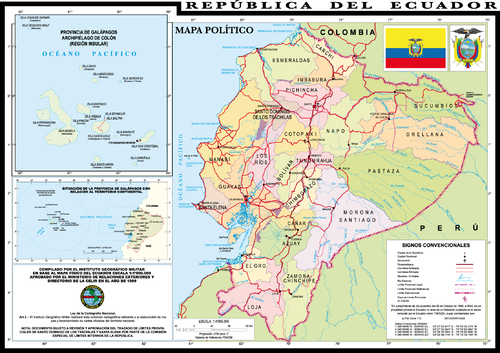 Ecuador is a representative democratic republic in South America, bordered by Colombia on the north, Peru on the east and south, and by the Pacific Ocean to the west. The country also includes the Galápagos Islands in the Pacific, about 1,000 kilometres (620 mi) west of the mainland. The main spoken language in Ecuador is Spanish (94% of the population). Languages of official use in native communities include Quichua, Shuar, and 11 other languages. Ecuador has an area of 258,238 km2 (99,706 sq mi). Its capital city is Quito, which was declared a World Heritage Site by UNESCO in the 1970s for having the best preserved and least altered historic center in Latin America. Ecuador is divided into 24 provinces, each with its own administrative capital. The provinces are divided into cantons, and further subdivided into parishes.